Father working with his son looking on. While our blog typically focuses on the pieces being crafted at Abbey Woodworking, this month we take a pause to highlight the work being done at another Benedictine woodshop...it just so happens that this woodshop is halfway around the world. This past month, Fr. Lew Grobe O.S.B. had the opportunity to help set up a new site for the Saint John’s Benedictine Volunteer Corps at Christ the King Priory in Tororo, Uganda. Founded in 1983, this Benedictine monastery of 35 monks serves the local community through their Benedictine Eye Hospital and Benedictine Vocational Training Center. Among the many certificates offered at the vocational school is one in woodworking and carpentry. Being a woodworker himself, Fr. Lew spent much of his free time at their woodshop observing how they teach and craft their furniture. The woodshop itself consists of an indoor space that houses the machines: planer, sander, radial arm saw, band saw, table saw, mortiser, and shaper. Many of these machines came from Europe and are built to last. At the time of Fr. 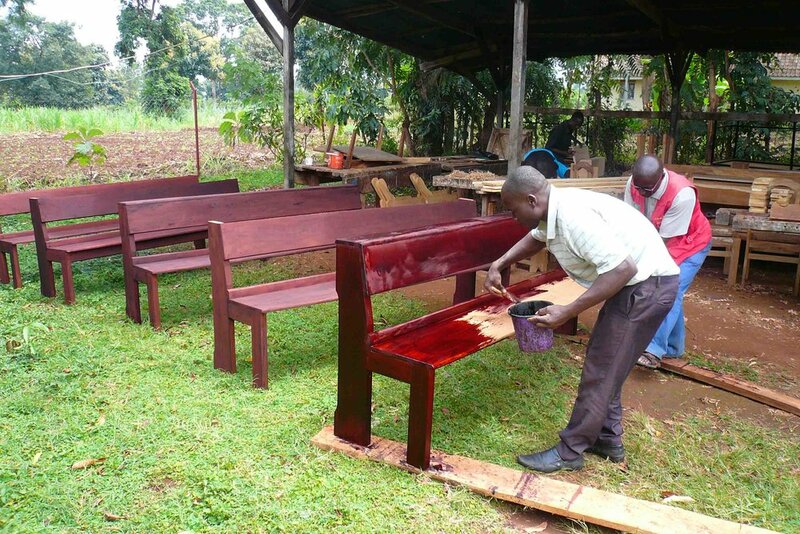 Lew’s visit, the shop was working on an order of 150 pews for a local church, a presider’s chair, bee hives and doors. Their furniture is often designed by the monks and then crafted by the students and lay employees. After the wood is initially worked, the individual pieces then head outside to one of the open sheds where it is further worked, assembled, sanded, stained and finished. Much of the furniture they create is made out of Mvule, a local, slow growing hardwood sometimes referred to as African Teak. It is known for being dense, durable and resistant to termites. There is no readily available kiln, so their wood is air dried on site. The monks have also dedicated about 75 acres of their property to the planting of trees (this is also where they keep their bees!). It is their hope that within 25 years, some of these trees will be ready for harvest and use in their shop. Furniture from their shop is seen throughout the monastery, schools and guesthouse. One of their monks was also a gifted sculptor and artist, so you will see a few examples of his wooden carvings in the pictures below. While Christ the King Priory is half the world away, it is fascinating to see their shop following many of the principles that Abbey Woodworking seeks to uphold: craftsmanship, use of local resources, dignity of manual labor, and honest use of materials.